Springfest, State Fairgrounds, & More! What Is It About Fairs? 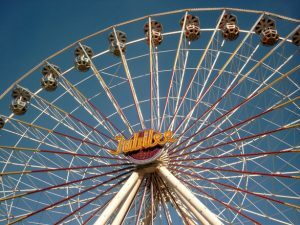 Am I the only one who remembers state fairs to be some of the most memorable and enjoyable experiences of my childhood? I can still remember the feeling of waking up in the morning when I knew my family and I were going and I couldn’t contain my excitement. It was almost like waking up on Christmas morning knowing that there are loads of presents just waiting for you to open and enjoy. Now that I am a mother, I can appreciate the fact that state fairs are among the most enjoyable and bonding things that you can do as a family. Sure, you can go to the movies or to a park but going that extra step can make a world of difference. What kid doesn’t love the chance to ride a horse and watch a pig race in the same place on the same day? If you caught my about page, you saw that I worked for Springfest which was a huge state fair held in Chippewa Falls, WI and I had nothing but great times doing so. There is so much that goes on behind the scenes to make sure the event is as enjoyable as possible and I want to try and make everyone else as excited about fairs as I am!